With the 2017 Hall of Fame class set to be announced on Wednesday, January 18th, I began to think about the active players around Major League Baseball who are inevitably going to find their way to the Hall of Fame. There are quite a few, with a wide range of teams having strong candidates. However, as I was pondering, I began to wonder: Could I name a player from every single team with a chance at the Hall of Fame? It took me a good amount of time, but I was finally able to do it. Now, keep in mind, some of these players you will definitely agree with, but some you will question my sanity. Admittedly, some of my picks are extremely unlikely to make their way to Cooperstown, but there are some teams that are so young or sparsely-talented that I had to go with a long-shot pick or extreme projection. But the wild predictions for certain young stars is part of what makes this conversation so much fun. The Marlins have quite a few standout players who very well could be headed towards Cooperstown if they can keep up their stardom over the next decade or so, but the one player on their roster that’s already a guaranteed inductee is Ichiro Suzuki. Coming over from Japan in 2001, Suzuki has long been one of the best players in baseball, notching over 3,000 hits in his MLB career to this point and subsequently receiving countless awards. As such, he is a no-doubt Hall of Famer. This isn’t as easy of a pick as the one of Ichiro Suzuki, but the one player on the Rays roster with enough of a track record to suggest as being on a Hall of Fame track is assuredly Evan Longoria. Hitting a career high 36 homers in 2016, and recording his most RBI’s since 2011, the next few years will tell the tale. But at only 31 years old, Longoria is the surest H.O.F. bet of all of the players currently on the Rays. He has an extremely long way to go, but with the stats he has produced over the course of his career, Freddie Freeman is well on his way to making it into Cooperstown. At just 27 years old, Freeman is theoretically in his prime, as was evident in his posting of 31 home runs last season. If he can post even a few more of those, the Braves’ All-Star first baseman could be on a very promising path towards the Hall of Fame. He may not be well into his 20’s quite yet, but Manny Machado is well into his Hall of Fame career. Sure, it’s a bit early to be typing up Machado’s induction speech, as anything can happen in baseball, but the Orioles’ third baseman has recorded back-to-back 30 homer seasons each of the last two years, and is posting numbers rivaling those of a previous Baltimore third base superstar: Brooks Robinson. It may seem a bit of old hat to be naming Bryce Harper as the Nationals current best shot at the Hall of Fame, but it’s absolutely true. Despite having a poor season by his standards last year, Harper — who will be 24 years old all of the 2017 season — already possesses 121 homers. If Harper can have a bounce-back season this coming year, the Hall of Fame may be in the cards for him when all is said and done. The Mets’ player I feel is the most likely to put together a Hall of Fame career when he decides to hang up his spikes is Noah Syndergaard. (Yes, you read that right.) I’m well aware that Syndergaard only has 55 career starts under his belt, but with David Wright succumbing to injuries that derailed his overall chances, and guys such as Yoenis Cespedes not having enough games remaining to put together a case, Syndergaard is my long-shot pick. Gary Sanchez — no, I’m just kidding. But the player I do have slotted to be a Hall of Famer down the road isn’t all that much older than Sanchez. With Aroldis Chapman dominating the opposition for so long, it can be easy to forget that Chapman is just heading into his age-29 season. With a career 2.08 ERA thanks to his blazing fastball, as well as his ability to lock things down in the ninth, Chapman is on the fast-track to the Hall if he can continue to blow batters away. With the departure of Ryan Howard, and the Phillies being in a drastic youth movement, it was very hard for me to land on a single player who stands the best chance at the Hall of Fame. But even so, I decided to go with Maikel Franco. He is still extremely young, and is still adjusting to the bigs. But the potential for 30+ homer power is definitely there, and that could lead to a bright future for Franco and the Phillies. The Red Sox just lost a future Hall of Famer in David Ortiz, but picking the next player to follow in his footsteps wasn’t all that difficult. Keeping with the theme of young players with big futures, I tabbed Mookie Betts as the player on Boston’s active roster with a chance at Cooperstown. I hate to make a selection with such a small track record, but after what Betts showed the baseball world last season, a superstar has been born. I’m not sure Josh Donaldson has enough big seasons left in him to put together Hall of Fame caliber numbers, but he stands the best shot of all of the players north of the border. While some youngsters such as Aaron Sanchez and Marcus Stroman are off to amazing starts to their career, Donaldson has become an absolute star. With back-to-back 35+ home runs season, Donalson will at the very least become a Toronto all-time great. If Andrew McCutchen can turn things around from a year ago to have another superstar season in 2017, he will also be back on track to a Hall of Fame career. The best player on the Pirates’ roster when he’s at the top of his game, McCutchen is a five-tool athlete in every sense of the word. Although the stats of McCutchen aren’t overwhelming upon first glance, when you look closely, a compelling case is certainly being made. The newest member of the Indians is also their top Hall of Fame candidate at the moment. Edwin Encarnacion may not have the numbers yet, but he very well could get there before his career is over. Averaging 39 homers a year over the past five seasons, Encarnacion could theoretically join the 500 home run club if he can play until age 40 and blast a tick over 27 home runs per season. The Tigers have quite a few great players, despite it not showing up in the standings last season. But the one player that is an absolute Hall of Fame player is Miguel Cabrera. The former Triple Crown winner is simply one of the best players to ever play the game of baseball, and is well underway to making it to Cooperstown. At just 34 years old on April 18th, Cabrera is one of the few must-see players before they retire currently in baseball. It’s going to be close, but the current Cincinnati Red who has shown any chance at a shot at the Hall of Fame is Joey Votto. The on-base-machine falls right into the coveted 3-4-5 slash line with a career .313/.425/.536 line, despite his hit numbers and homer stats sitting a bit low when compared to those players already in the Hall of Fame. But the overall play of Votto is definitely worth Hall of Fame consideration. How weak is the Cardinals current active roster? So weak that I went with rookie Alex Reyes as their best shot at the Hall of Fame. In fact, I actually had to skip the Cardinals and come back to them when writing this, frankly because I don’t view any of their active roster with any confidence as to them having even a chance at the Hall of Fame. But having to pick a player, I ended up going with the 22-year-old Reyes, who showed a ton of potential in 2016 and is expected to breakout in 2017. I originally placed Jon Lester (of all people) as the Cubs’ active future Hall of Fame player, as he is somewhat underrated as a starter, especially when you look at his career numbers. But it’s hard to overlook Kris Bryant, who broke out last season to hit 39 home runs. With his 40+ homer potential, if Bryant can put together multiple big seasons in a row, his case for the Hall of Fame will begin to build. The White Sox have made it evident that they are currently in a huge rebuild mode, trading away Chris Sale and Adam Eaton so far this offseason, with other moves expected before Opening Day. With that in mind, I ended up picking Todd Frazier as their Hall of Fame path player. Although Frazier has a somewhat weak case at the moment, if he can continue to produce numbers much like those he has posted in recent history, Frazier will be very close by the time he retires. I’m not the biggest Ryan Braun fan after what went down a few years ago, but there’s no denying his talent. Following a few down seasons, Braun bounced back again in 2016. If he can continue to keep his track record going, Braun could be a very compelling candidate for the Hall after his playing days are over. As the best player on the Brewers, he also claims the slot as their best chance at the Hall of Fame. There are several different ways I could’ve gone with this. If Byron Buxton produces to his full ability the way he has been hyped, he would be the top pick; the same with Miguel Sano. If Brian Dozier hit over 40 homers for a few more seasons, he would line up on that path as well. But I ended up going with the safe choice of Joe Mauer, who is a bit low in some of his career stats, but has enough great seasons to deserve some consideration. Catchers get little recognition for just how difficult their jobs behind the plate is, and Salvador Perez has proven to be one of the best. One of the biggest low-risk high-reward examples in recent history, the Royals have a star in Perez, and he could very well be on the patch to Cooperstown as a slugging backstop. With 20 homers a year and a cannon for an arm, Perez has the whole package you’re looking for from a catcher. Jose Altuve is undoubtedly the biggest superstar on the Astros, with Carlos Correa and George Springer quickly joining him. But while newly acquired slugger Carlos Beltran would be all too easy to overlook, it’s important to view Beltran for the player he is. With 2,617 hits and 421 homers, one more solid season from Beltran very well could sway those who are on the fence about his candidacy for the Hall of Fame. While others don’t seem to agree, I feel that Adrian Beltre is a no-doubt Hall of Famer no matter how you slice it. Assuming he can stay healthy, Beltre will become the 31st player to reach the 3,000 hit mark in 2017, and that is all but a guarantee for enshrinement in my mind. One of the all-time best third baseman in the history of baseball, Beltre is an easy Hall of Fame pick. Nolan Arenado is as close to a complete player as you’ll find in the game today. Winning a Gold Glove each of his first four seasons, his future Hall of Fame case will extend far beyond his defense, as he belted over 40 homers and recorded over 130 RBI’s each of the past two seasons. Despite playing in Colorado — seen as a negative by many — Arenado would be a superstar in any ballpark. For that reason, he should still be seen as the future Hall of Fame player he likely is. Over the course of Paul Goldschmidt‘s career to this point, he has shown a pattern of having one great season followed by a merely average season. However, if he can find a way to produce some of the superstar level seasons he has previously, Goldschmidt will have a legitimate Hall case. Given, Goldy may not be able to produce on the level needed for the Hall of Fame, but he currently stands the best shot in Arizona. Will the real Wil Myers please stand up . . . That’s the sentiment of many around the baseball world. Following a Rookie of the Year season in 2013, Myers hadn’t produced on the same level through last season. But in 2016, Myers absolutely broke out, earning his first All-Star selection and hitting 28 blasts. With the power he possesses, he has the ability to carry the Padres on his back, and if he indeed does that, could be walking towards Cooperstown. Adrian Gonzalez has been great for a long time, and Corey Seager is on a rapid ascent into stardom. But let’s face it — Clayton Kershaw is Clayton Kershaw. Year in and year out, Kershaw is among the finalists for Cy Young and has consistently been the Dodgers’ best pitcher since his poor rookie season in 2008. As such, Kershaw is undoubtedly a future Hall of Fame pitcher for the Dodgers. Mike Trout receives an extremely high honorable mention, as baring any unforeseen issues Trout is on a clear path to Cooperstown. But credit has to be given where it’s due, and therefore Albert Pujols falls as my pick for the Angles’ Hall of Fame active player. With him sitting just nine homers back of 600, Pujols is already an all-time great player, and should be fully appreciated as such while he’s still playing the game. Buster Posey is a fantastic player and will likely continue to be for the Giants for years to come. But the player I chose as the most on a Hall of Fame path is Madison Bumgarner, who has proven time and time again the caliber of pitcher that he is. With a career ERA of 2.99, Bumgarner has been a big part in the Giants three World Series titles over the last seven seasons. As such, he is on a very special career path. The Athletics aren’t the best team in baseball, and therefore don’t have the best selection of above-average players. But even so, Sonny Gray stands out as their best chance at fielding a Hall of Famer player down the road from their current roster. His 2016 stats of a 5.69 ERA over the course of 22 starts hurt what was beginning as a special career, but if he can rebound in 2017, Gray can get back on that track. With a perfect game, it is already evident that Felix Hernandez is a great pitcher. But when you take the time to dive into his career numbers, you get an idea of just how special he is. Already nearing Hall of Fame stats, Hernandez will be just 31 for all of the 2017 season. He still has numerous more seasons to add to his 2,264 career strikeouts and improve upon his 3.16 ERA. But no matter what, Cooperstown likely awaits him. The Most Valuable Player award was first given out in 1911 to Ty Cobb of the American League and Frank Schulte of the National League. Originally known as the Chalmers award, named after Hugh Chalmers, the award didn’t catch on as well as had been hoped, and therefore was discontinued after the 1914 season. In 1922 the League Awards were established to honor the baseball player in the American League (National League began being recognized in 1924) who provided the greatest all-around service to their club. The winner — who received a medal and cash for winning — was voted on by a committee of eight baseball writers, with a player not being able to win more than once. Like the Chalmers awards, these awards didn’t last long, stopping in 1929. Finally in 1931 the Baseball Writers’ Association of America Most Valuable Player award was established, which is the award still given out today. Voting for the award is fairly straightforward. Two writers from each city of both the American League and National League make up the Baseball Writers’ Association of America (BBWAA) voters for the Most Valuable Player award, making a total of thirty voters for each league (fifteen teams, with two voters per city). A first place vote earns a player fourteen points, a second place vote gets nine points, a third place vote receives eight points, a fourth place vote is worth seven points, and so on, all the way until tenth place for one point. Once added up, the player with the highest overall total wins. There is no specific criteria for the voters to use when choosing the Most Valuable Player, but some suggested attributes include value of a player to his team (strength of offense and defense), number of games played, and a player’s overall character, disposition, loyalty and effort. Anytime a players posts a .297 average with 41 home runs and 123 RBI’s, they have to be considered as a very strong candidate for Most Valuable Player. That’s exactly what Josh Donaldson was able to do this season, and he was the favorite heading into the award announcement on Thursday night. Josh Donaldson wound up winning by a fairly large margin, amassing a total of 385 points off of 23 out of 30 first place votes, with Mike Trout getting the other 7 first place votes and 304 total points, and Lorenzo Cain placing third with 225 points of his own. This marks the third time that Trout has finished second in the American League MVP voting, joining him with Mickey Mantle for second most runner up finishes in baseball history. But with the year Donaldson had, you simply had to pick him to take home the honor. Helping the Blue Jays make the playoffs for the first time since 1993, Donaldson came up time and time again throughout the year for Toronto, and proved his value in some very big spots. He becomes just the second player in Blue Jays team history to win the Most Valuable Player award. If Donaldson can keep it up and post another incredible season in 2016, it very well may not be his last time in the running for the award. There were three finalists for the National League Most Valuable Player award, but there was truly only one choice. The year Bryce Harper had made him more than deserving of the award in the minds of many people. Inevitably, the Baseball Writers Association of America agreed. Bryce Harper received all 30 first place votes for a collective 420 points. Paul Goldschmidt received 234 points, and Joey Votto got 175 point from the voters, earning him a third place finish. At 23 years of age (Harper just turned 23 in October), Harper becomes the youngest player to ever win the MVP by a unanimous vote, and just the seventh all-time. 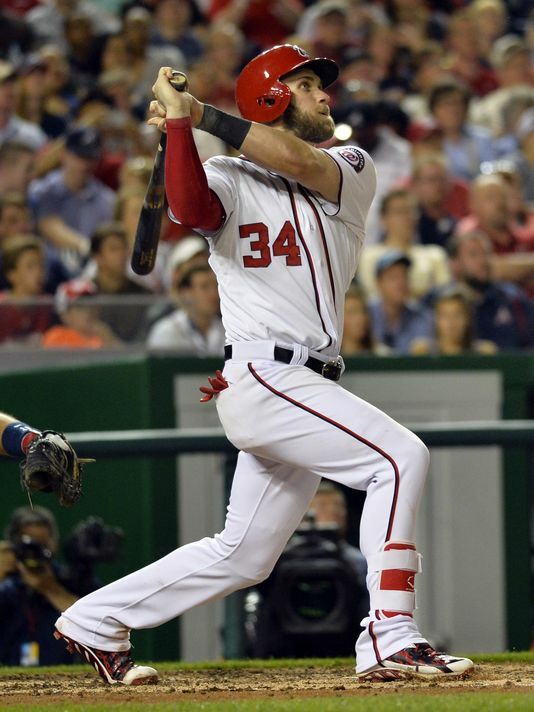 In addition, Harper’s MVP is the first in Washington franchise history. Batting .330 with 42 home runs, combined with a .460 OBP due to 124 walks, made Harper the easy pick for the award. While the Nationals didn’t make it to the postseason — a factor that has played a large part in the voting in recent years — it didn’t truly matter. His stats were more than worthy of him being the first player since Albert Pujols in 2008 to win MVP from a team that didn’t reach the playoffs. Finally able to have a fully healthy season after battling injuries over the early part of his career, Harper ultimately was able to break out as a superstar, and all signs point to him being able to keep it up as he matures into his prime. Both Josh Donaldson and Bryce Harper had terrific seasons in which they came up time and time again all season long for their given teams, making them very valuable. Moving forward, they will undoubtedly be in the MVP conversation in future seasons. It should be interesting to see which players emerge to challenge them in 2016. The 2015 Major League Baseball Players’ Choice Award winners were announced Monday night on MLB Network. Unlike the BBWAA awards, these awards (as the name would suggest) are voted on by players from around baseball each September, when they receive a ballot to make their picks for each category. 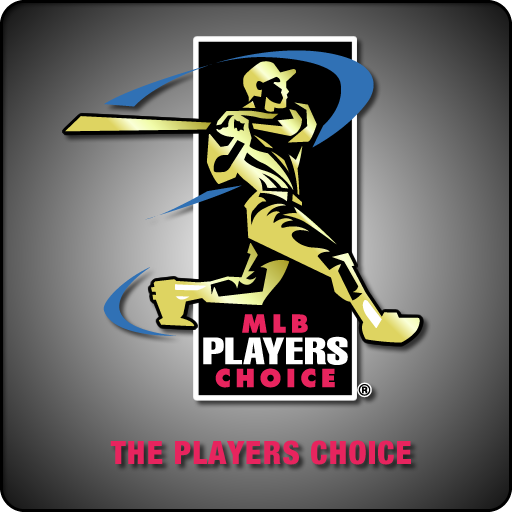 Seven categories in all, American League players vote for American League players, with National League players voting for National League players; with the exception of the Marvin Miller Man of the Year award, Always Game award and the Player of the Year award, in which players from both leagues vote for a single player. The players absolutely got it right in my opinion. Both winners are likely to pick up the BBWAA Rookie of the Year awards when they are announced next week, as each had terrific campaigns. After a .279 average with 22 homers and 68 RBI’s, all while playing a great defensive shortstop all at the age of 21, Carlos Correa is sure to be a big part of the Astros for the next decade or two. Likewise, Kris Bryant had an unbelievable season, hitting 26 homers and notching 99 RBI’s, helping to send the Cubs back to the playoffs for the first in what would seem to likely be several years to come. As with Rookie of the Year, you very well could be looking at the winners of the BBWAA Cy Young award with this category. Dallas Keuchel and Zack Greinke went about their success in different ways, but both had results that made them dominant each and every start. Keuchel had a breakout season, going 20-8 with a 2.48 ERA. All season long, he was lights out for the Astros and was a big part of them making it to the postseason. Greinke was also great each and every start, winding up with unfathomable stats of 19-3 with a 1.66 ERA. That’s certainly worthy of this award. After playing all 162 games in three straight years, Prince Fielder participated in only 42 games in 2014 due to a neck injury. Coming back to play all but four games in 2015, Fielder certainly put up stats worthy of this award. This season, Fielder launched 23 home runs and drove in 98 runs, all while hitting a solid .305. Matt Harvey was in much of the same boat as Fielder in 2014, having missed the entire year due to Tommy John surgery. But Harvey came back with a vengeance in 2015. Harvey went 13-8 with a 2.71 ERA on the year, and helped the Mets make it all the way to the World Series. This award was brand new for the 2015 season. It was established to honor “the player who — game in and game out — constantly exhibits grit, tenacity, perseverance and hustle; all for the benefit of his teammates and fans”. All of the players nominated for the award were worthy, but Jose Altuve took home the award. Altuve has been a huge part of the Astros over the past few years, and plays the game full on for every single out. He is definitely the player I would have chosen for this award, and I’m glad to see him win. 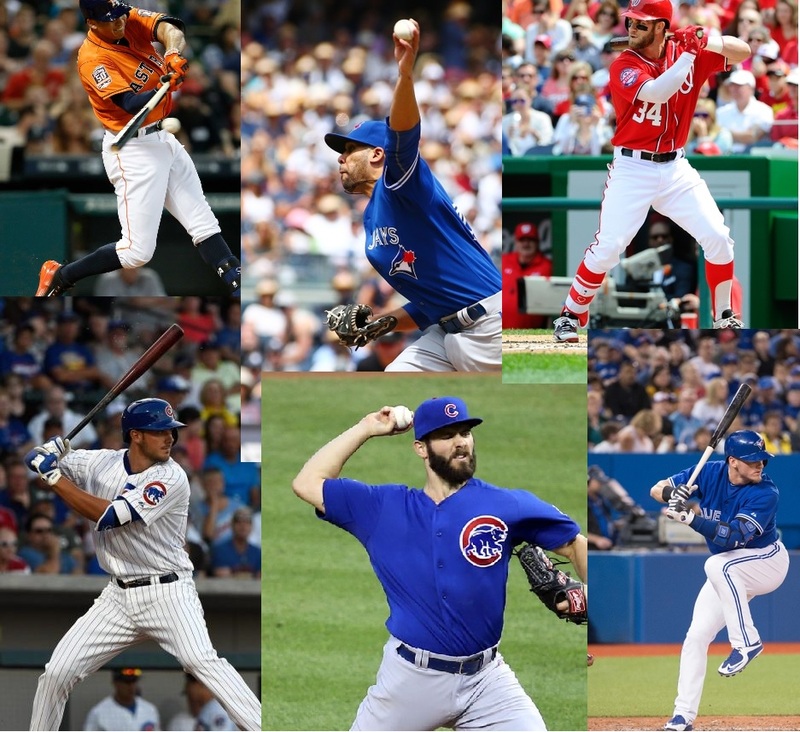 There were dozens of outstanding players throughout Major League Baseball from the 2015 season. With that said, there were a handful that stood above the rest. For this category, it was Josh Donaldson and Bryce Harper voted on as the outstanding players of the year. Many people — myself included — have Donaldson and Harper picking up the MVP for their respective league when the official award is announced next week. With Harper having hit 42 homers to go along with a superb .330 average, and Donaldson blasting 41 of his own, it is no wonder why they each took home this particular honor. In the minds of many people around the baseball world, this is the most important award given out each season. The Marvin Miller Man of the Year Award is given each year to the player most recognized for outstanding on-field performance and off-field contributions to his community. Past winners include Mark McGwire, Albert Pujols, Chipper Jones and Mariano Rivera, among many others. This season, the award was presented to Adam Jones, who certainly does more than his fair share of contributions both to his ball club and to his community each year. With all three players presenting equally impressive seasons in their own way, you could truly make a strong argument for any of the nominees to win the Player of the Year award. 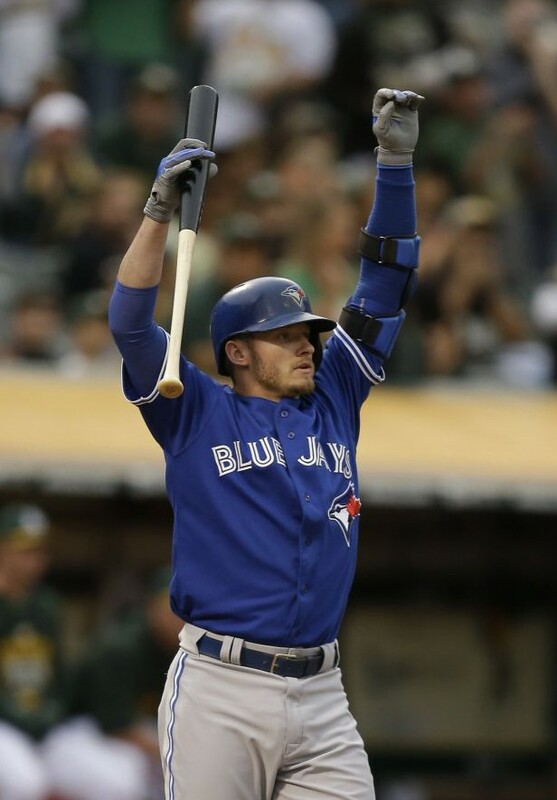 But, in the end, the season Josh Donaldson put together was magnificent. His 40+ home run year truly helped drive the offensive side of the Blue Jays, along with Jose Bautista, Edwin Encarnacion and the late season pickup of Troy Tulowitzki. Combined, Toronto was able to reach the postseason for the first time since 1993. A lot of that can be credited back to Donaldson, who came up big all season long. Over the past week, or so, I’ve been typing up individual posts on who I feel most deserves the awards of American League and National League Rookie of the Year, Cy Young and Most Valuable Player. I was planning to post the awards for each on back to back days, with a day in between, but I decided to publish them on six consecutive days instead. Some of the choices were easy, while others took a great deal of debate. But in the end, I went with my gut of who I feel deserves each award the most. In case you missed a few (or all) of my Major League Baseball award posts, I wanted to do a brief recap. Although there are a couple of picks that people will likely disagree with, this is just the way I would vote if my vote had any say. Feel free to click the links associated with each award to be taken to my post on it, giving the full reasoning behind my picks. I’m planning to post a blog entry covering the winners of each award when they’re announced towards the middle of next month, comparing my original picks to the winners and giving my overall thoughts, so be sure to check back for that when the time arrives. Choosing the Most Valuable Player from each league is the most difficult decision of all the major baseball awards handed out at the conclusion of each season. With Rookie of the Year and Cy Young you can usually look solely at which player had the best overall stats, but Most Valuable Player sometimes involves a bit more than just stats. While it’s important that an MVP winner had a great statistical year, the best offensive player doesn’t automatically become the most valuable. With that said, it was an even more difficult vote for me this season than it has been in seasons past. There are several players, including Josh Donaldson, Mike Trout, and even Chris Davis, who were all extremely valuable members of their given team in the American League. However, in the end, only one player can win the Most Valuable Player award. Chris Davis posted some unbelievable stats in 2015, of 47 home runs and 117 RBI’s all while hitting a solid .262. Whenever a player does that, they have to at the very least be acknowledged as a valuable member of their given team. Even so, while Davis was arguably the most valuable Orioles player, he was by no means the most valuable player in all of the American League. That honor came down to Mike Trout (once again) and Josh Donaldson. But while Trout had another incredible statistical season, in which he brought a tremendous amount of value, he won’t be picking up his second straight MVP. Despite an elite on base percentage of .402, along with 41 homers, Trout didn’t quite put up the numbers needed to win the award. 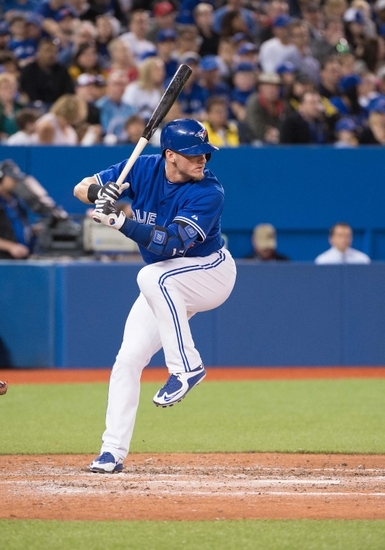 In my opinion, and the opinion of many others around the baseball world, Josh Donaldson is the best choice for the 2015 American League Most Valuable Player award. All season long, Donaldson came up big for the Blue Jays time and time again. Although the likes of Jose Bautista and Edwin Encarnacion did their fare share of carrying the team, it was Donaldson leading the charge. With his 41 homers, league-leading 123 RBI’s and batting average of .301, Donaldson truly earned the MVP. Although we don’t yet know who the captain for the American League and National League home run derby team is going to be, I wanted to go ahead and give my take for which players I’d like to see in the home run derby up in Cincinnati on July 13th. Assuming the rules change from 2014 that saw an additional player being added to each league’s derby team stays the same, I selected the five players from each league that I wanted to see in the derby. Nelson Cruz: Of all the players from the American League to choose from, this was the easiest of them all. Nelson Cruz led all of baseball in home runs back in 2014, and is well on his way to finishing near the top again. Although Cruz can hit tape measure shots, I think he would do well in the derby due to his ability to hit numerous home runs as well. He would put on a show. Josh Donaldson: Donaldson isn’t that widely known as a slugger, but he has been a breakout player over the past few seasons, and is having a great year with the Blue Jays this season. Donaldson can really launch the ball a long way, and I think that he would stand a shot at winning if he can find a groove and stick with it. Having him in the derby would definitely be fun. Mark Teixeira: This isn’t the most obvious of picks, as Teixeira has been up and down over the past few years, but he is having a good season this year, and he should be in the home run derby. Somewhat surprisingly sitting in the top five of the American League in homers, Teixeira would be a general sleeper pick for the derby, but if he could get things going, he would last awhile, I believe. Mike Trout: There truly isn’t anything in baseball that Mike Trout isn’t good at, and that includes hitting home runs. Trout is currently one of the most well known and liked players in baseball, and having him take part in the derby would get more people to watch. And I feel that they would be treated to a show, as Trout would likely hit several long homers on his pursuit of the title. Edwin Encarnacion: Josh Donaldson’s teammate, Edwin Encarnacion, can hit a ball just as far, if not farther, than nearly every other player in the big leagues. It’s that ability to launch balls a great distance that I think would make him great for the derby. He would be able to put on a show, hitting balls deep into the stands, and would stand a good chance at making it deep into the derby. Paul Goldschmidt: Goldschmidt is well on his way to having a great season yet again, and that includes posting a large number in the home run category. Goldschmidt has the ability to hit numerous home runs in addition to hitting them a great distance, and that makes him perfect for the home run derby. He would represent the National League extremely well in the competition. Todd Frazier: Frazier would be on my list of derby participant regardless of the fact that his team is hosting the All-Star festivities, as he has great stats that warrant the selection. However, it is an added bonus that Frazier is a Red, and that would inevitably make him a fan favorite among the crowd. Frazier might not win, but he will give the fans an extra something to cheer for. Giancarlo Stanton: Stanton was the favorite to win the 2014 derby by nearly everyone, but he disappointed to say the least. But although he didn’t win, Stanton hit balls further than nearly all of his competition and was still able to put on a show. With him having another great year, I think Stanton would do better in the derby and deserves another shot at winning the whole thing. Joc Pederson: The fact that Pederson is merely a rookie and is launching home runs as if he’s been in the majors for a decade is remarkable. And that’s why he deserves to be in the derby. Pederson would likely hit balls farther than anyone with the exception of Stanton, and he would be able to put on a great show. Therefore, having Pederson in the derby is something I’d really like to see happen. Bryce Harper: Harper surprised some people in the 2013 derby with how well he did, and with him having such a good season this time around, I think he should be in the derby once again. Harper isn’t liked by some around the baseball world, but his talent can’t be denied. If Harper can find a pace he’s comfortable with, I think he stands a really good shot at the derby crown. So, those are my picks for who I’d like to see in the 2015 home run derby up at Great American Ballpark on July 13th. Odds are that not all of them will be selected, but I truly hoped the majority of them are in the derby. Do you agree or disagree with my picks? Who would you like to see participate? Leave your thoughts in the comment section below. 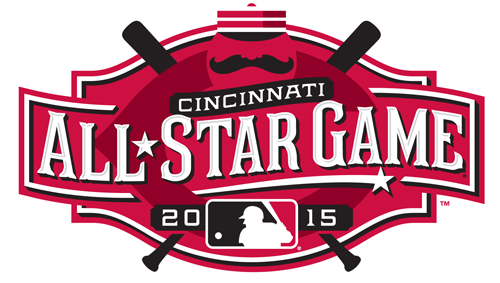 The ballot for the 2015 Major League Baseball All-Star game has been out for awhile now, but I’ve been holding off with casting my votes for who I’d like to see in the game up in Cincinnati on July 14th. With it seeming like the ballot is coming out earlier and earlier each year, I wanted to give players enough time to put up quality numbers before I made any decisions. But I finally feel there are enough stats to make a logical decision. It came down to Miguel Cabrera, Eric Hosmer and Mark Teixeira for me in the American League portion of the first base spot. While Teixeira leads in homers and RBI’s, his batting average was too low for me to select him. In addition, Eric Hosmer has fewer homers and RBI’s than Cabrera in more at-bats, and thus, I picked Miguel Cabrera. In the National League, it was another tough decision. While Paul Goldschmidt is producing another year worth of MVP caliber numbers, and although Anthony Rizzo is getting better and better, I voted for Adrian Gonzalez. Getting off to a hot start to begin the year, Gonzalez holds the second highest batting average in baseball and deserves to make it. Jose Altuve leading all of American League second baseman in stolen bases, sitting second in average and third in homers was enough to get him selected by me to make the All-Star game. Although Devon Travis of the Blue Jays has been a highlight reel each night, Altuve is one of the most exciting second basemen in baseball. The National League race for All-Star second baseman was an easy decision on my part. Dee Gordon is deserving of the spot, no question about it. Gordon doesn’t have any home runs, but that’s not his game. He leads all NL second basemen in stolen bases, and holds a batting average above .400. That’s deserving of All-Star recognition. I’ll be honest — I had to double check Marcus Semien’s stats when I was casting my vote for American League shortstop. I knew he was having a good year, but I didn’t realize how good. Leading the American League shortstops in homers and stolen bases, Semien is the unlikely frontrunner for the honor. It was no easy task to choose a shortstop that had the best stats for the All-Star game. There are a ton of them with good numbers in one category or another. But while names such as Zack Cozart, Jhonny Peralta, etc., stood out, I went with Brandon Crawford, who has good numbers as well as the amazing defense to match. You could make cases for Manny Machado, Mike Moustakas, Josh Donaldson and even Evan Longoria for the American League third base spot in the All-Star game. But I went with Donaldson, who is having a fantastic year. Sitting second in homers but first in RBI’s among AL third basemen, Donaldson should be in Cincy in July. The first and only Red on my list — likely to be a favorite with the Reds hosting the All-Star game — is Todd Frazier, who I selected for NL third base in the midsummer classic. His batting average isn’t the best, but he is at the top in homers and is deserving in my mind of the honor. This is somewhat of a shocking pick, but a very deserving one. Stephen Vogt wasn’t all that well known as recently as a year ago, but his bat is making him more of a common name. Vogt leads AL catchers in average, home runs and RBI’s, and should lead them in voting when all is said and done. I could’ve easily picked Miguel Montero or Yasmani Grandal to make the start behind the plate for the National League, but I went with the always consistent Buster Posey instead. Posey leads AL catchers in homers, and should be adding another All-Star game to his already impressive resume. Although the designated hitter role in the All-Star game goes to David Ortiz the majority of the time, there is simply no other choice for DH this year than Nelson Cruz. It’s not even close. Cruz leads all designated hitters in homers, runs batted in and average, and will be in the All-Star game up in Cincinnati. Mike Trout was a nobrainer, as he once again is in the process of posting another fantastic season, but the other two spots were somewhat difficult with all of the great players. In the end, after examining all of the stats, I made the tough choice of Josh Reddick and Adam Jones. I hope to see them in the All-Star game starting lineups. As with Mike Trout in the AL, picking Bryce Harper for National League outfield was the easiest choice of the three. But after a lot of debate between the candidates to fill the other places, I wound up choosing Justin Upton and Giancarlo Stanton. Upton is having a good year, and despite a subpar average, Stanton is dominating yet again.